Happy Needle and Thread Thursday, friends! Usually, I am meticulous about figuring out exactly how many prints and pieces I need to cut for a project before I even begin, but after finishing my Poolside quilt, I realized that a rare miscalculation left me with quite a few extra squares. Since they were all uniform sizes, rather than add them to my scrap jars, I decided to sew them up and make a little preemie quilt. My guild donates these to a local hospital each year, so I always have that in the back of my mind. I like to donate a few quilts each year, and using up leftovers for them makes it a win-win. 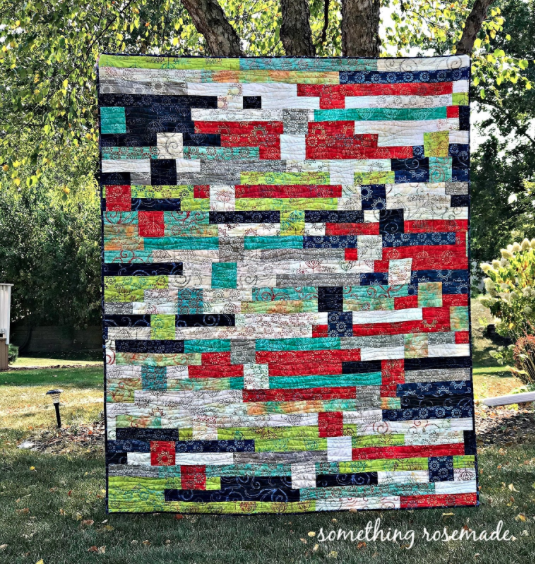 This little quilt measures just 36 inches square, with the larger squares in the photo finishing at three inches and the smaller ones at just an inch and a half. It won't take me long to finish this one up- and just in time to join my other two preemie quilts for our guild donation day this Friday. Last week's party was amazing, with lots of fun inspiration. 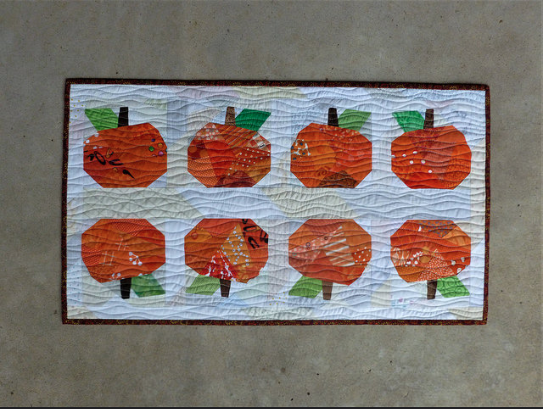 Check out this cute pumpkin table runner by Lisa Marie. This puts me in the mood for fall! This sampler quilt by Tanya Quilts in CO is so cheerful! I love the eye-candy, and I can't wait to see what's going on in your space this week. Let's link up! Those are really lovely scraps in your little quilt. What a beautiful preemie quilt! I just love the colors and the random formation. I love the colour palette of your baby quilt. Although I, too, thought it was larger until you mentioned the size. What a great way to use up those leftovers. They made such a pretty little quilt. It looks much larger than you said. Those are some tiny squares. Very smart to use those left overs immediately. It's a sweet little quilt, love the colors. You know, I knew about using scraps for baby quilts, but completely forgot! I have at least two sets of scraps needing to be sewn up and cuddled with! Thank you for the reminder! I so appreciate your link up as I always find inspiration! Thank you!